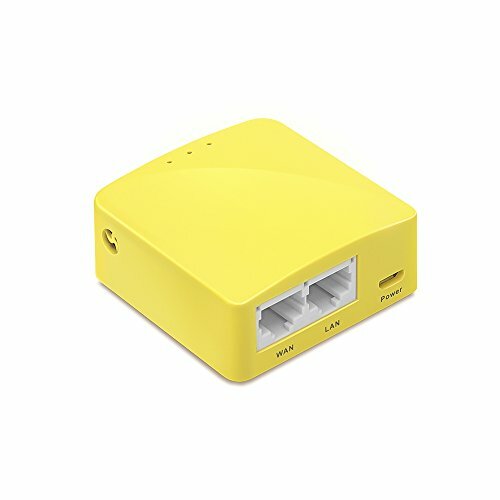 GL-MT300N-V2 mini travel router is the upgraded version of GL-MT300N. It is powered by MTK 7628NN 580Mhz SoC with a better Wi-Fi and a faster OpenVPN encryption. Memory increases from 64MB to 128MB. Wi-Fi is extremely popular but still may not be available at anywhere. If you are still using a wired network at hotels or cafes, this mini router is able to convert it to a wireless network for sharing the Wi-Fi with all your devices. Even in places like cafes or restaurants with Wi-Fi, it may not be a good idea to expose your devices to the public network directly. This router converts a public Wi-Fi to your own Wi-Fi with a firewall and then works as an agent for securer surfing. The agent connects all your devices when switching to a new Wi-Fi. You don't have to input password for each of your devices. The router is equipped with 128MB RAM and 16MB Flash, which can be further extend using external USB sticks. There are 2 Ethernet ports, 1 UART, and 4 GPIOs available for hardware DIY hobbyists. It is an ideal portable gateway for IoT (internet of things) development. OPEN SOURCE & PROGRAMMABLE: OpenWrt pre-installed, USB disk and WebCam extendable. If you have any questions about this product by GL.iNet, contact us by completing and submitting the form below. If you are looking for a specif part number, please include it with your message.